Dorm shower flip flops are an obvious college dorm necessity. But you shouldn't settle on just any flip flops for shared bathrooms. If you pick up an ultra-cheap pair of dorm shower sandals, you run the risk of tripping over your cheaply-made sandals, slipping on the wet floors, or walking around like a hunting Elmer Fudd as you try not to slip or squeak in your college shower shoes in the morning. 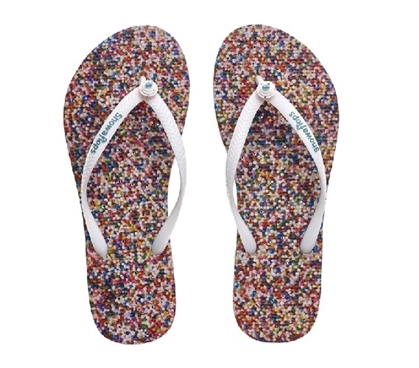 Skip the danger and get something a bit more practical and completely you with our Showaflops - Women's Antimicrobial Shower Sandals in Sprinkles. Our dorm shower flip flops are specifically made for your communal college dorm shower. Our Showaflops in Sprinkles have unique drainage holes and a textured pebble surface to help prevent you from slipping out of your shoes both during and after your shower. The Deep Diamond Grooves on the underside of your college shower sandals help provide a bit more traction than traditional sandals so you won’t slip on slick or wet surfaces on your way back to your dorm room. Our college dorm shower shoes are anti-microbial so you won’t have to worry about any mysterious illnesses or diseases popping up after your first few months in the dorm. After all, 20+ people can share your communal dorm shower and it’s only (hopefully!) cleaned once a day. Our Showaflops dorm sandals are also perfect for your gym showers, beaches, or water parks so you can always be comfortable and hygienic no matter where you are or where you need to bathe. Our Showaflops in Sprinkle reminds you of the sweeter things in life and the stuff you have to look forward to instead of reminding you to watch your step or be extra careful while in your shared college bathroom. Because, well, dorm life is hard enough without worrying about slipping in your college dorm shower.